Hello folks … yay it’s Friday! And having just finished a major project at work, I’m ready to relax. Perhaps some of my readers may think that writing a blog post is an odd way to relax, but don’t knock it ‘til you try it. :) Okay, so let’s get to my review of Vita C Elixir from Aura Naturel. 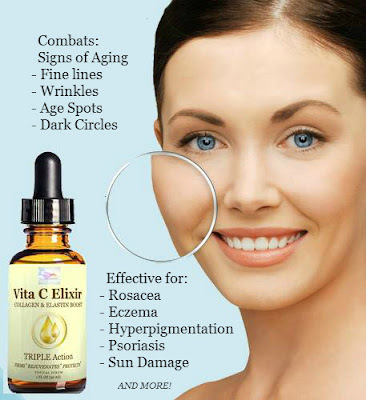 To start, Vita C Elixir from Aura Naturel is a vegan product. Actually I probably should have shared with you guys that I have mild psoriasis. I was diagnosed a little over a year ago and I refuse to take oral medication. I believe in attempting to seek out a natural route first and I’m still looking for the proper combination of treatment. As for my psoriasis, I tend to have patches on my inner arms and they can be painful. I started using Vita C Elixir a few days ago and after the very first application, I could feel the soothing and nourishing affects. I’ve also used Vita C on my face neck, décolletage and hands. It has a faint scent, is fast absorbing and makes the perfect nighttime skin treatment. This time of year we are incredibly busy and I often have dark circles – who am I kidding I usually have dark circles, but I can happily confirm that Vita C Elixir helps alleviate that issue! Aura Natural states that Vita C is helpful for wrinkles, fine lines, age spots, acne scars, hyperpigmentation, rosacea, dry skin and skin damaged skin. I figure that if Vita C can help with my psoriasis and dark circles, it can certainly be an asset for the aforementioned conditions.